Like Seinfeld was a show about … nothing, this is a post about … nothing. I’m gonna fake it, but in the end the stunning photos will make this another winner. 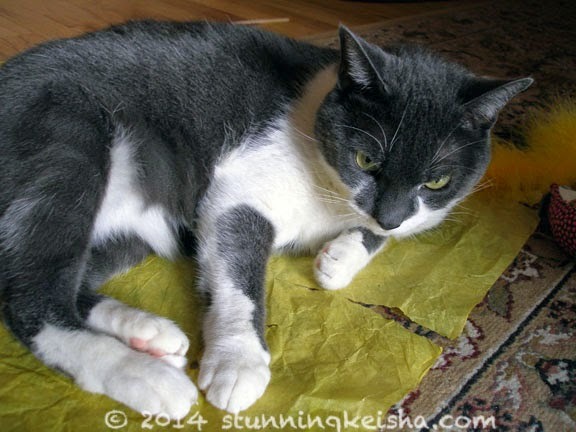 You may have noticed I’ve been posting a lot of photos of me siting on tissue paper. Here’s a couple more. Lately, my one-track mind has switched from foam rockets back to tissue paper and peacock feathers. I can be found night and day sitting on or by my tissue paper. You can be sure that once TW gets tired of kneeling on the floor with me, the tissue paper will disappear until next year cos she’s mean that way. Yo! Woman, get over here with that peacock feather!! Didn’t I warn you? And the Oscar goes to Cathy Keisha!! KKMM loved Christmas time! She would get into all the paper and help me by sitting on the wrapping paper I was trying to use. Not to mention all those ribbons... Looking good CK! CK, you are looking particularly stunning today!!! ...and not to take anything away from that, but TW is doing a fabulous job with that flashy box of hers! In fact, we can tell she's not even making the flashy box flash!!! 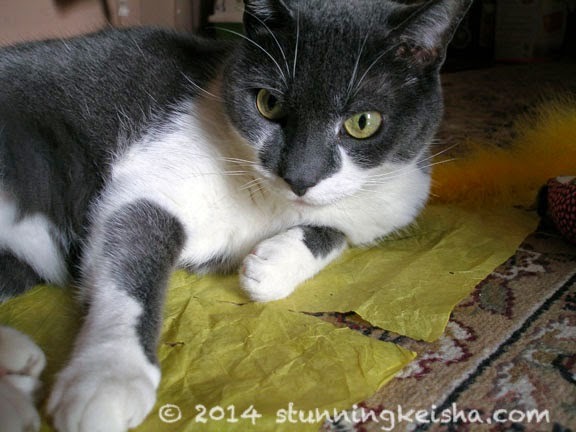 We don't get to play with tissue paper enough around here! My human needs to get some just for us kitties. The color on the tissue paper suits your eyes purrfect CK ! We must thank Mommy for chasing down the lady walking along the road with a huge bunch of peacock feathers to get a couple for us. Though we must say we don't appreciate her putting those precious peacock feathers WAY UP HIGH where we can see them waving at us but not touch them. We must ask for some of that tissue paper you seem to enjoy. Are they nice to rip into tiny pieces? CK you are the most stunning Diva ever. Have a tremendous Thursday. Stunning is the word CK....and concats on winning the Googie bed from Miss Layla too! WOO WOO...may I suggest a couple of sheets of tissue on that? Would make it oh so comfy. We have tissue papers laying around in the house, too! Of course the Oscar goes to you, CK! We like how you coordinate your tissue paper with your eye color. So fashionable. Stunning photo of you CK. Makes me want to give you a big SMOOCH! Whoops, hope I didn't offend the boyfriend, but couldn't help myself as you are so smoochable. This post is a winner because it has photos of you, CK! haha! Loving the award and the tissue paper! Thanks for linking up with us! You always are the stunning gal CK! We love all kinds of paper and tissue is summery as crinkle silk. Soon you can lie on your own Googie Bed! Just a few more months and you'll have all the tissue paper you want. We had a party the other day and mistakenly hung crepe paper streamers everywhere. It was festive and most of the kitties just played with them, but one certain cat (Yukon) thought they were hanging salami and wanted to munch on them. Oh, well...we cut them well beyond kitty height. He loves tissue paper, too but doesn't eat it. Our kitty would be eating that tissue paper!! BOL! That tissue paper would be in pieces around here, CK. Magic say's go you with the crinkly tissue paper but Red says he's more of a crinkly, crunchy plastic man. MOL!! Our humans LOVE Seinfeld!!! And they just learned how old he is *gulp* - they claim tha's simply not possible! Yes you are stunning as always! Love the tissue paper. Mom needs to get us some! Great job, CK. You're ALWAYS the winner of "Most Stunning" to us! BFGF, tissue...good light, great photographer...equals one Stunning CK! !